The Henderson Mine is located 50 miles west of Denver, CO. The mine has been in operation since 1976 using a panel caving process and a rail transportation system to mine molydbenum. The rail system was a 42-inch cantenary style railroad. Motive power was supplied by 32 Swedish built ASEA electric locomotives. Each locomotive rode on two axles and weighed 55 tons and was dual voltage 1400 and 600 d.c. volts. The lower voltage was for safety purposes in close clearance portions of the mine. The Henderson Mine also had three small diesels on their roster for non-electrified portions of the line. The rail line moved ore 14 miles from the mine to the mill using 250 20 ton ore cars. The railroad included a 9.8 mile tunnel under the Continental Divide that was longer than either the Cascade or Moffat tunnels. The tunnel was said to be the 10th longest railroad tunnel in the world. After 23 years of operation the railroad ceased operation on July 30, 1999. This unique railroad was replaced by a conveyor belt system and an historic piece of Colorado mining history became a memory. Eivind Jensen (Idaho Springs, Colorado) on 2014-02-13 18:26:47. A very fine and accurate summary of a momumental engineering achievement. I know because I worked there for many years, and had the privilege of riding with an ore train on the ASEA locomotive from the mine to the mill and back. Larry Elarton (Bethel AK) on 2012-03-23 22:03:13. Nice video, some more overalls of the interior of the mine would have been cool but it was fun. Especially great for those of us who worked there! 7800 level, 1976-1978, Mine mechanic, Chris Harnish crew. flute player (Piqua, Ohio) on 2011-09-10 14:23:42. I thought there could of been more coverage of the trains than the people. It was a very interesting railroad. Wish there could of been more track side shot and train coverage. Steve (Black Hawk, Colorado) on 2011-05-13 18:19:43. Great video! Was very enjoyable to see how the trains ran inside the Henderson mine. I would love to see another video on the operation of the mine itself. 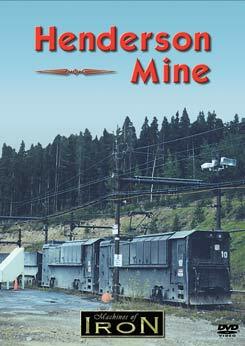 Some very good video and history and is a must for any mining or Colorado history enthusiast. Image quality: A little rough around the edges. Recommend to others? Not unless they REALLY were interested in the subject matter. Not a bad video of the haulage system. I really enjoyed it more than most may because I used to work on the locomotives and saw some of the people I used to work with. Brought back some fun memories.